Take this unforgettable cruise along River Spree while seeing must-see places in Berlin. 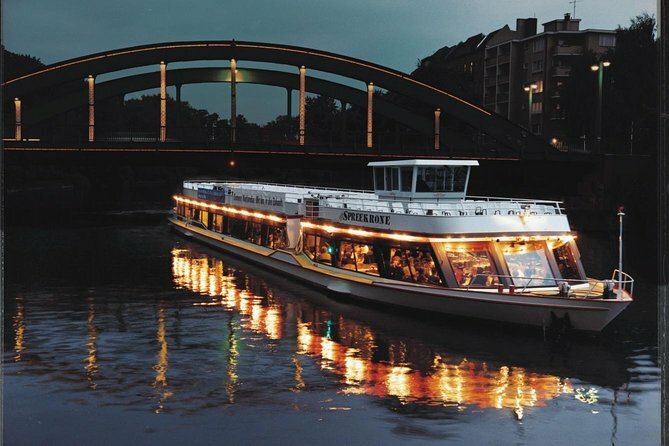 During this 2.5-hour evening cruise through illuminated Berlin, you will see modern and historical sites, such as Bellevue Palace, House of the Cultures of the World and many others. Throughout your excursion, enjoy a delightful 3-course dinner with drinks. Enjoy the countless modern and historical attractions Berlin has to offer, such as Schlossbrucke, Charlottenburger Ufer and Hansaviertel, from a completely new perspective with this 2.5 hour river cruise, while learning about their history in both English and German. Cruise along the River Spree passing under iconic bridges and bypassing more of Berlin’s must-see sights: Spreebogencenter, Bellevue Palace, House of the Cultures of the World, German Chancellery, Central Train Station Haupbhanhof, Reichstag, Museum Island, Berliner Dome, TV Tower, Berlin's Red Town Hall, Nikolai Quarter and Muhlendammschleuse. During your entire trip up and down the river, the light breeze will keep you cool – even on the hottest days of the year. Creme of courgette soup with croutons. Chicken breast baked with tomatoes and mozzarella, served with tagliatelle and pesto. To wash it all down, you will receive 2 drinks, either beer, wine, or non-alcoholic options. Enjoy this memorable experience with friends or loved ones while watching the nightlife in Berlin come alive during your sumptuous meal.